Potty Training your New Family Member! Depending on where you live, you may be house training your dog to go to the bathroom on puppy pads or newspapers. Ultimately, the idea is to train it to go outside to go to the bathroom. 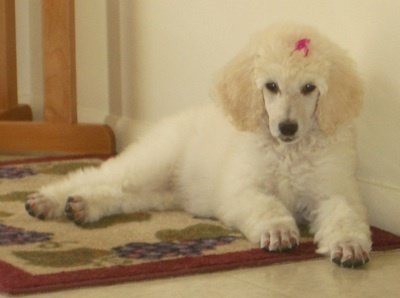 The length of time it takes to train your Poodle can range from a few weeks to a few months. It takes time for him to realize that the house is his living quarters and not a huge toilet! Puppies have small bladders and need to go to the bathroom every few hours. Unless you catch your Poodle in the act of messing in the house, never scold him, hell just wonder what youre yelling at him for. Just get some paper towels and clean up the mess. Never, under any circumstances, hit your puppy for messing in the house or rub his nose in it. Puppies need to be on a strict schedule when house training. They should be taken out to potty after eating, waking up, and after playing. Take them to the same area all the time, so they eventually know where they are supposed to potty. This can either be on the puppy pads or in the same area of the yard. If they have an accident in another area, pick it up and move it to the area where you want them to go. Make sure you give your puppy or dog lots of praise when it goes potty in the correct area. If you start out house training your puppy on puppy pads and eventually want him to go outside, every day or so move the puppy pad a little closer to the door that you will want him to go out. Eventually, you can move it out to the yard and then eliminate it all together. Make Outside their potty place. Try and not take the puppy outside to play often until they are house broken. Let them associate outside with potty time. Try to feed your Poodle at the same time everyday. This will make it a lot easier to regulate when your puppy will need to go potty. Feed your puppy the highest quality food you can afford. The better the quality the less waste there is. I always keep my poodles on puppy food, with a protein content of at least 28%. This helps with the poodle's "tear staining" issues! Dont give your puppy any food or water after 7:00 at night. This will help prevent accidents in the middle of the night. Take him out right before you go to bed and first thing when you get up in the morning. If you cant supervise your puppy all the time, its a good idea to keep it contained in a small space like a playpen or crate. This will help avoid any unexpected accidents. I have another page on my site dedicated to crate training. If you dont have a yard to let your dog out in and have to take your dog for a walk to go potty, try not to get him too excited or disturb him too much while hes looking for a place to potty. Be sure to take plastic bags with you whenever you walk your dog to pick up any messes! If you follow these steps and are patient and consistent, you should have a house trained Poodle in no time!